Although I know it already, it never ceases to surprise me just how true it is. Learners of all ages need the opportunity to experiment with a new medium before putting it to its more formal or expected use. Often this kind of activity is called 'playing around' which I often perceive as a derogatory term in relation to learning. But, in my experience, if you observe children at play long enough and really pay attention you will be astounded by the myriad of ways they are representing their knowledge, understanding and mastery of a subject. Play and exploration are not wasted time. In fact, I think it is exactly the kind of activity that builds the foundation of real understanding. Here is a case in point from a recent Math in Your Feet Family Night. Having finally found success using straws and pipe cleaners as a math toy and building material with my own first grader, I decided to include it in the Family Night for the first time. I made some models of polygons and polyhedra, gave the station volunteer a quick orientation, and left the materials to be discovered. ...which the kids politely and assiduously ignored as they confidently forged ahead. This initial inclination to explore the materials on their own terms was fortified by the fact that this was not officially 'school time'. There was no pressure to do things 'right', or follow the rules, or learn and use proper technique. As a result, most kids cheerfully ignored the formula for folding a pipe cleaner in half and making a nice right angle before inserting it as a connector between two straws, and instead found their own twisty or unequal ways to make it work. Most also ignored the nice models I had made and created their own. I had never heard of a hexagon cube, for example, but there it was! They were having a grand time 'playing around' when I noticed something amazing happening. After a very focused exploration period, they started discovering the rules on their own! This little one, two years old according to her brother who sat beside her, had been methodically putting pipe cleaners into the straws, one after another. It looked like a little gallery of Q-tips, someone joked. She was working on her own. She must have been at it for thirty minutes and then...she started connecting straws together! Voila! A hexagon. No one, I suspect, expected much out of a girl so young. And yet, there she was discovering the materials and watching others around her, ultimately creating something for herself. I'd wager that if someone had insisted on sitting her down and showing her how to make a hexagon, she might have been less interested, engaged, focused and, ultimately, successful. Children much older also experienced this same progression. Check out what her brother was building, below. Kids kept coming up to me wanting to know if they could have the dodecahedron I made as model for the night. Sort of like a door prize? I said, "Well, no, that one's mine. But you could make your own!" Only one girl decided to make one for herself; she also really wanted me to sit next to her while she figured it out. I provided moral support for about five minutes, and then had to 'go do something...' A few minutes later, she came and found me with a question and, still later, enlisted support from another adult so she could finally finish it. But you know what? She did all the work, she just needed help 'seeing' the structure and pattern. If we had had more time she and I could have talked how to make all the angles congruent so it would be more regular but, still...what a prize! So, what kind of learning was happening during all this 'playing'? 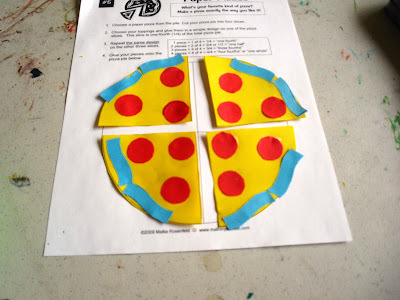 I heard a teacher mention that this activity reinforced the learning they were doing in class about corners and sides. Yes, and so much more. The side of the shape becomes a shared edge. You only need one straw for each edge. The more you build on to your initial shape, the more this aspect of intersection and sharing is apparent. A vertex can be created from the intersection of two, three, sometimes even five different lines/edges. Depending on what polygon or polyhedron you're making, the pipe cleaners need to be bent at different angles. An equilateral triangle's angles are different from a square's which are different yet again when you create a hexagon, or a pentagon. These are properties you might not truly understand unless you had to make them yourself. And, when every angle in a shape has to be the same, and you're the one who has to make them that way, you truly build a new understanding of 'sameness'. And that's just the math stuff and just what I noticed while watching them build. I'm sure there's more. All in all, a good evening's work. I think my new definition of success is when my project idea is just the starting point and, over the course of the 'lesson' not only do multiple right answers emerge but the children are satisfied with their efforts. If the resulting mess is any indication, I'd say it was an entirely satisfying evening. We've had a bunch of visitors in the last few days. We show them around our house. They see the ten million stuffed kitties. The see the kid's collection of old books, including the 120 year old speller and the 80 year old (very cool) atlas. They see the fantastic, never-ending headstand (hint: not mine). And then they walk into our sun room. "What is that?" they ask. This is what you'd look like from the outside if you were sitting inside it. "I want the inside to be a different color, Mama, so you can see where the middle is." We have what we call our 'making studio' in another part of our house, and we make a lot of math these days, so it makes sense the kid would think of our new installation as a math studio. How did we make this wonderful structure, you ask? Lots of newspaper, tape and pipe cleaners. You can read all the details here. Sometimes, all you have to do is ask the question. I was looking for more geometry to do with the kid, so I headed over to the Living Math Forum for some inspiration. Needless to say, I got great suggestions which jump started my thinking process in a big way. Not all of the suggestions worked for us at this particular moment; my daughter is not all that enamoured with computer games, for instance, even though there are a ton of great online math game resources. I also got some recommendations for building sets, but historically she hasn't been drawn to that kind of thing. Also, most of them are pretty pricey and I'm just not sure I'd want to risk the money at this point. 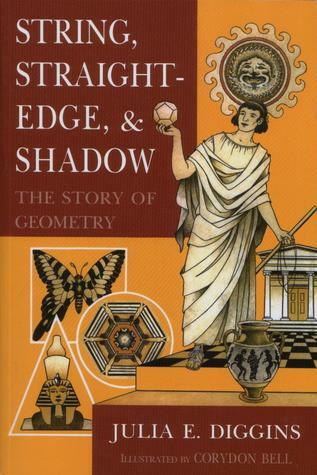 One of the best suggestions for my particular learner was the book String, Straight Edge, & Shadow: The Story of Geometry by Julia E. Diggins. We found a copy at the library and are taking it a couple of pages at a time. It's a wonderful story but a bit dense, in the best possible way. There's a lot to ponder and it's worth taking a few days to process things between readings. Every time we read it we immediately find connections in our daily life. My favorite thing about the book so far is the writing which weaves in and out of descriptive suppositions about how early humans discovered the circle or the right angle interspersed with conversational observations about how a child might also observe those same ideas in his or her daily activity and environment. After reading about right angles today in a chapter about early earth measurers, a simple folded piece of paper has now become our 'right angle checker.' We use it to observe how this helpful angle maintains order within our physical world allowing us to move easily through life without worry of wonky walls or telephone poles. I never knew a right angle was so interesting, useful or ubiquitous! Anyhow, it seems geometry is everywhere, just waiting for us to find it. Such is the nature of small math moments. For instance, the kid has really taken to what I'm calling her 'geometer training'. She's a whiz with the compass. We had an initial, and very successful, exploration of circles one Sunday and, a few days later our second round found me exploring concentric, intersecting circles. The kid tried making her own. In our first round of exploring circles, the kid saw a triangle when she placed three circles in this position. This time, as we sat working together, I took a minute to illustrate for her how I saw those triangles (below) -- by connecting the center points, and also by extending straight lines on the outside. After pondering what else besides a compass might energize our study of geometry, I decided it was time to go out and purchase the game Blokus. The kid was thrilled when she found that over half of the pieces are actually mini, multi-colored pentominoes. (I also found a great pentomino puzzle generator for up to six pieces here.) The rules are not hard (all pieces of a certain color need to be touching corners to play) but the kid keeps noticing the open spaces and wanting to fill them in with the shapes instead of playing the 'touch corners' rule. The picture below is when we finally decided to throw out the rules and see how many different sized squares and rectangles we could make out of the entire inventory of game pieces. For some reason, this was a lot more fun for her. I modeled counting the squares around the perimeter to determine whether it's a square or a rectangle and figuring area from multiplying length and width. I think that an adult modeling his or her thinking and problem solving process in a real-life context is one of the most potent teaching tools at one's disposal. Speaking of modeling, the best way to get my kid interested in something is to be doing something interesting myself (like coloring in triangular grids) and having some 'extra' on hand for her to do as well. Sneaky Math Mama! Sunday morning walks have become our routine and look at this beauty we found last weekend! This morning she suffered through half of a fun (to me!) book on polygons. The first half was about triangles, so next time we go out we'll be able to use our new words -- scalene, isosceles, equilateral, right angle, obtuse angle and acute angle. Or, how about this? I love the stair step rectangular blocks. The girl noticed the circle first, but there is also a little square in the middle of it, and look! Small triangular blocks creating a square around the circle. Awesome! And neither of us could resist the big red circular table with cool circular cutout decorations in the middle. It may be hard to see but the inner circle is made of little squares rotated 45 degrees and the outside ring I can't quite describe but is so lovely. I'm in the middle of prepping for a Math in Your Feet Family Night for next week. The kid really wants to go, but it's far away and she has a ridiculously early bedtime. But, I said, I could bring up a few activities from the basement. What would she like to do? Turns out, the rotational paper pizza designs were quite engrossing. And, it's been months and months since I was obsessed with making the Platonic solids out of straws and pipe cleaners, a process she basically only observed. But, when she found out they were part of the family night she suddenly got interested in making one all by herself! A really tall tower of cubes, that is. My previous experience showed me that six inch straws do not hold up well under scrutiny from children, but three inch straws actually create a comparatively stable structure. Maybe I should go for a building set after all. Seems like she might be ready for it!